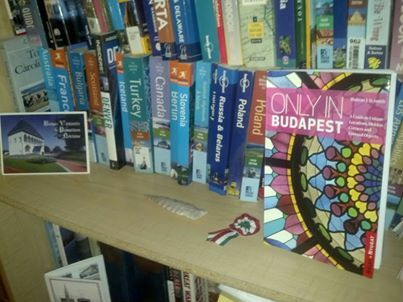 I first discovered Only In Budapest at the Alexandre bookshop on Andrassy Utca. Just outside the glittering Bookcafe (formerly the Paris Department Store) in the English books section. The holdings were entirely predictable. Chain book shops like all chain stores have a way of homogenizing the inventory. Thousands of books begin to look like all the ones you’ve already read. There were tons of tour guides, concise histories that are anything but, large hardback albums full of photos that never look quite real, and a few novels from authors of popular Hungarian works translated into English, by the usual triumvirate of Marai, Moricz and Kertesz. Only in Budapest caught my eye because of its colorful cover and the snap assumption that such a title was a reference to odd and curious stories that would be worth at least a quick glance. Quite possibly, I hoped to read tales of Magyar derring do in this city that is both split and united by the Danube. At best this book could both inform and amuse, at worst it would be filled with tidbits of trivia best left to the Hop In-Hop Off Bus Tours. After a few minutes thumbing through one fascinating story after another – all surprisingly well written in at most three or four pages – I was ecstatic. I had to have this book. It looked like a cure all for indifference. By this point, I had been in Budapest five times and seemed to be running out of interesting places to see. A ridiculous conceit to be sure, but I had visited everything from Castle Hill to Kispest . You know, it’s getting a bit thin on the ground when you while away an afternoon at the Postage Stamp Museum (actually quite an incredible collection). I was becoming numb to the beaten path. The Parliament building still glittered and gleamed, but a little less so. I began to notice its blemishes, such as the tremendous amount of work needed to keep up the façade. And then there was the Danube which was never blue to begin with, only now I began to notice. Budapest and I were beginning to have a problem. There must have been much more to see, but where was it at? Museums sounded stodgy, guided tours irritating, people watching – that’s what I did on the way to somewhere else. Websites that purported to tell me everything to see and do in the city, were a long recitation of tedious lists of what I had already seen and done. Many things I had done twice, frighteningly there were a few things I had done on every visit. I tried to comfort myself with a phrase I had once read, “All learning is relearning.” That seemed to be a bit loopy, in the most literal sense. It also seemed to be the motto of my past week, shuffling aimlessly through meaningless streets, hither and yon, staring listlessly at city maps, ignoring my guidebooks. The beaten path had beat me to death and the off the beaten path was just a cliché used to seduce wayward wander lusters. Thank goodness I had found Only In Budapest, it could be my own personal travel stimulus. With less than a week left to spare on this visit to Budapest, I decided to wait and order a cheaper, slightly used copy of from an online shop once I got back home. That’s what I did. The day it arrived I read the first entry, was satisfied and set it aside, waiting to summon it forth on my first day when I would arrive back in the city. Now I still have two weeks until I return so I picked it up again yesterday. I decided to read the introduction. This may seem strange, after all how many of us ever bother with intros or prefaces? We want to dive right in to a book. Impatience is one of my worst vices, it has caused me to skip titles, prefaces, subheadings and photo captions. I find all of these to be either disjointed or esoteric. I have been wrong on many occasions. I first learned the value of introductions and prefaces to the meaning of a book, was from the aptly, if annoyingly titled volume How To Read A Book: The Classic Guide To Intelligent Reading by Mortimer Adler. The title makes it sound like a book written for clueless dunces, but it should be required reading. Adler says the introduction should always be read before beginning a book. It will give us the most comprehensive overview of what the book is about. Of course, one could reply that after you read the book, you will know what it is about. Well not exactly. Consider this question: what are the chances you will read the whole book. Now compare that with your chances of reading the whole introduction. My bet is that you can make it through the intro. Even if like me, you suffer from an attention span limited by impulse and whim. In addition, the intro is the best place to discern what points the author is going to make. Then when you read the book, you can decide for yourself if the author makes those points well. An added benefit is that a well written intro should help you to get to know the author. It offers first contact with the author’s voice. Keep in, that if the preface confuses or bores, well then look out! If you can’t make it through a few pages, what are the chances of making it through thirty chapters. This was exactly what I was looking for! I am a little embarrassed to admit that I did not even consider reading the intro that day at the bookstore, shame on me. Smith laid it all out in just a page and a half. It was though he was reading my mind, and by reading the introduction I was reading his. Marcel Proust once said that, “kindred spirits come together, one has few really unknown friends.” Perhaps he was talking about a meeting of the minds, between author and reader as well. This is a simple, succinct invitation that is filled with of all things, love. Love of travel, love of the hidden treasure, love of seeking and finding, love of sharing, love of discovery, love of Budapest. Smith wrote this whole book, not just for money, but for love. The love of sharing one of the great cities of the world with travelers. He did it so they might first follow in his footsteps and then somewhere along the way step outside of themselves to suddenly find their own path. Make no mistake Smith’s audience is as big a part of the adventure as he is. Without fellow travelers, he would not have a reason for writing this book. He is imploring the traveler with an offer that I for one cannot refuse: to see Budapest in a different light and a different darkness, to lift the veil of obscurity and indifference, with an invitation to a series of unique experiences. I can see myself now in Smith’s shoes as I thumb through the entries. Visiting a vanished district in Obuda, delving into the mystery of Raoul Wallenberg that haunts the city’s history, wandering through the Chinese moon gate where East meets West in Pest and scaling the heights of a Belevedere Tower in the Buda Hills. In these glossy pages and forgotten places I am being born again. That’s the very best of what traveling can do. Only in Budapest! This entry was posted in A Trip Around My Bookshelf, Hungary Travel (104) and tagged Andrassy Utca Budapest, Bookcafe Budapest, budapest travel, Duncan J.D. Smith, How To Read A Book: The Classic Guide To Intelligent Reading by Mortimer Adler, Only In Budapest, Paris Department Store Budapest by fortchoteau1. Bookmark the permalink. I recently discovered your blog and I am very much impressed by your project. I wil visit Lviv in september and to find this source of information is almost like a dream to me. Up till now I read a lot of books about Eastern Europe especially Vanished Kingdoms by Norman Davies was a relevation for me. I enjoy being inducted in all this interesting facts and stories about a part of the world that was a black box for so long. I appreciate your approach and i’m sure my first visit to Lviv will profit from all my readings. What an interesting bookshelf. I’m Ukrainian and recently developed an interest in genealogy and in the history of Bukovina and Galicia where my maternal and paternal grandparents came from, respectively. I’m also interested in history and read much about European WW2. I was never taught about WW2 in high school (decades ago) and so this is quite the learning experience. I hope to read some of the books on your wonderful list. Your web site is a great source of knowledge. Thank you.